Baby Rhino Don at Baby Rhino Rescue | Adopt and Donate Now! Don was orphaned when his mother was poached in the Kruger park. Very young and suddenly alone and terrified, he went in search of shelter and protection and approached a grey-colored vehicle, perhaps mistaking it for a rhino. 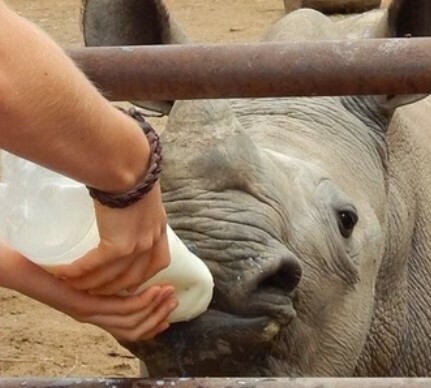 Because baby rhinos are so dependent on their mothers, they recruit replacements in a desperate bid for survival when their mothers are poached. They will imprint, meaning treat other animals, humans or even objects, as a replacement for the mother they have lost. He leaned against the car, looking for shelter. Don English, head ranger in the Kruger, arrived quickly and with a vet set to work, quickly tranquilizing Baby Don in preparation for him to be flown to Care for Wild Africa. He was loaded into a helicopter to be transported quickly to the sanctuary. In the helicopter, Don suffered cardiac arrest and the pilot had to make an emergency landing. After three minutes of resuscitation and frantic efforts to save him, a miracle happened and the little rhino gasped for air as his heart started up again. Everyone was in tears, but the rhino arrived safely into the expert hands at C4WA. Baby Don has very quickly become a very happy young rhino and has settled in nicely. He is quite a character: very cheeky and he especially likes mock charges, to scare the sanctuary staff. But everyone knows his antics, so he brings laughter, happiness and light!